Many investors are looking to buy a crude oil index ETF to profit from oil's rise throughout 2015. WTI oil prices are up 7% this year. And we expect oil prices to continue climbing in 2015. The expected oil price climb has made crude oil index ETF investing increasingly popular. The Wall Street Journal reported about $6 billion was invested in oil ETFs in the first quarter alone. The problem is known as "contango." Contango happens when prices are higher than the spot price of oil. You see, many of these oil ETFs track futures contracts rather than the spot price. When there's a price gap between the price of the expiring contract, and the new futures contract, the fund has to buy contracts at the higher price. That means the fund is constantly buying high and selling low. For example, if the new futures contract is $2 higher than the expiring one, investors will encounter what is called a "negative roll yield" of $2. 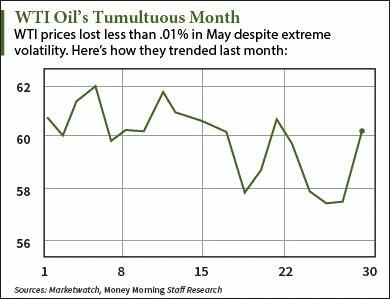 Again, the ETF is buying high and selling low to track the price of oil month to month. Contango typically occurs during periods of unusually low prices and high production. The last time this happened to oil prices was the "supercontango" during the 2008 financial crisis. Back then, oil tanker ships stockpiled millions of barrels of crude oil off the coasts of the Gulf of Mexico, England, and other major production areas. The spread between spot prices and futures prices 12 months later was more than $23 a barrel for WTI. Any spread between the spot price and futures price can cause crude oil index ETFs to miss profits. The chart tracks price movements in the WTI spot price of oil compared to the U.S. Oil Fund LP (NYSE Arca: USO). The United States Oil Fund is one of the most popular oil index ETFs on the market. Financial Times reported that more than $2 billion was invested in it in 2014. But USO misses out on gains when the market is in contango. 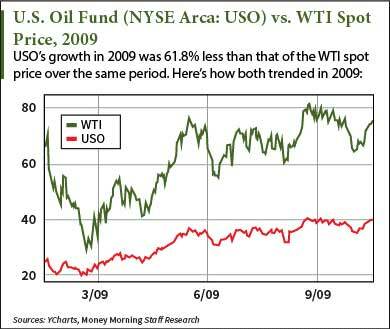 From 2009 to 2011, WTI prices increased more than 115% while USO only gained 34%. USO also endures harsher tax treatment. ETFs that track oil futures contracts face higher taxes than other funds due to their regulation by the Commodity Futures Trading Commission (CFTC). That means investors receive higher taxes as well. While a crude oil index ETF offers some returns, there are better profit opportunities in the energy sector. The best oil stocks to buy during contango periods are midstream master limited partnerships (MLPs). These are the firms that own assets like pipelines and storage facilities.